Many people say that Usain Bolt is a Legend. He hasn’t yet been crowned as a Legend though. Usain Bolt has recently become the first man to win the 200m sprints at two consecutive Olympics. Apparently as he has recently won these medals, it is making history. But yet they don’t want to crown him as a legend. Why? Because the president for the IOC Jacques Rogge said “The career of Usain Bolt has to be judged when his career stops.” “Let him participate in three, four games, and he can be a Legend. Already he’s an Icon.” I disagree. 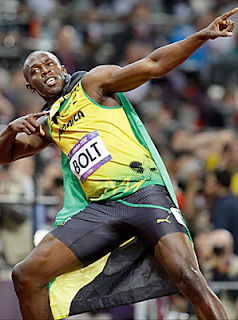 This shouldn’t stop Usain Bolt from being crowned a legend. From some of the research I have gathered, it is clear that Usain Bolt is a very inspiring athlete to many young and old people around the entire globe. And he can inspire those who think that they can’t strive to be winners. The one thing that inspires me about him, is the fact that he came from being nothing, to becoming an international sensation. This young gentleman, has also made up a really cool move of his own, name ‘The Bolt’. I love the picture and the story I like how you He hasn’t yet been crowned as a Legend though. I love that bit. You a great person... Keep up the good work.